There are some important points that a company must know before sending your goods to Brasil. At Brasil the rules for import are very strict, and if someone disobey the rules can be punished by a fine, even if it was done by a mistake or misinformation. The importer will be responsible for paying the fine, and may also lose the goods. There are bunch of goods that need license to be able to enter at Brasil. There are some government´s agencies and departments that are responsible for analysing these products and authorizing the entry into Brazil through a document called Import License. Then the importer must wait for the authorization of the license, it may takes a week, or even some months, depending on the kind of product. ANP - Oil and oil products, natural gas and biofuels. CNEN - Radioactive Materials and Equipment generating ionizing radiation. CNPq - Goods for scientific research and technological. DECEX - Goods subject to: trade defense; tariff quotas; price analysis, weights, measures, classification, qualities and types. DNPM - Diamonds and Asbestos. DPF - Chemicals that can be used for the illicit preparation of narcotic substances, psychotropic or cause physical and psychological dependence. Exército Brasileiro (Brazilian Army) - Weapons, Ammunition, Explosives and War Material. IBAMA - Live animals, except domestic, products derived from wild animals, some types of woods, Residues and waste, some chemicals, Materials harmful to the ozone layer, Tires and certain vehicles. INMETRO - Products subject to labeling energy efficiency, Products subject to compulsory certification under the regulatory INMETRO. For example: children's toys. MAPA - Animals and their derivatives, by-products and parts; Plants and their derivatives, by-products and parts; Pesticides and fertilizers; Other agricultural inputs; Wine and beverages. 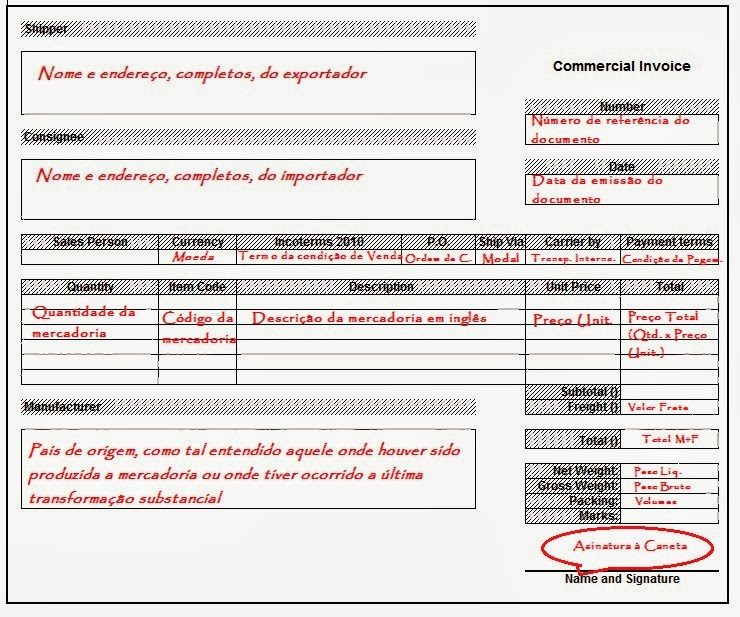 The Commercial Invoice is the main document to export to Brasil. It must be filled in with all information about the agreement between the importer and the exporter, and with details about the product sold. The person who´s in charge of foreign issues at company must sign the invoice with a blue pen. Be sure that the Commercial Invoice will be signed in blue ink and by hand, only this way will be considered as original. The government does not accept copied signatures. Also it must be marked with company´s stamp. Don´t send a cargo as a courier to Brasil. In other words, do not ship a cargo using an Express Service. You CAN ship your cargo with FEDEX, TNT, DHL, UPS, etc, but make sure it´ll be shipped as a cargo. Some Express Companies require you to choose the service "BROKER SELECT OPTION" or "FORMAL IMPORT" to ship a cargo to Brasil. There are more points about the rules to export to Brasil, but I think these points above are the most important. What I suggest is to talk about these 3 points with the brazilian importer before shipping the cargo. Other issues can be "fixed" even after the cargo has been shipped. I hope all these information have been helpful, and any other doubts let me know, I would be glad to answer any questions about it. why do u say not to use express companies to import goods to Brasil ? Vi que é brasileiro, vou lhe responder em português. Falo em não usar serviços de remessa expressa. Você pode utilizar empresas como TNT, FEDEX, DHL, mas deve embarcar a mercadoria como carga e não como remessa expressa. Porque a remessa expressa tem limites e características definas, como valor de até USD 3.000 e não pode ter fins comerciais (veja base legal : http://www.receita.fazenda.gov.br/Legislacao/ins/2010/in10732010.htm). Uma empresa jamais poderia importar uma mercadoria para revenda utilizando o modal de remessa expressa, há impedimentos legais. Mas lembrando que estas informações valem para pessoa jurídica. Para pessoa física existem outras regulamentações.